Chester management duo Anthony Johnson and Bernard Morley. Leamington are gearing up for another bumper crowd tomorrow when Chester are the visitors to the Phillips 66 Community Stadium. The Blues have added star quality with the appointment of former Salford joint-managers Anthony Johnson and Bernard Morley in the summer. After an uncertain start the duo, who took Salford to the Conference North title, have lifted Chester to within a point of top spot and Brakes boss Paul Holleran says it should be another occasion to relish. 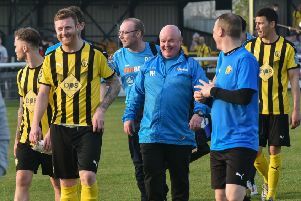 “It’s taken them a while to settle down but now they’re putting their own stamp on it, bringing in one or two of their own boys,” said Holleran of the management team. “They’re on a good run and it will be a tough game. But we’re looking forward to it on the back of the Nuneaton performance. “You always look forward to clubs like Chester visiting, former League clubs. Ahmed Obeng should be fit after being treated for a bang on the head at Nuneaton, while Colby Bishop will be looking to maintain his fine form since his return from an ACL injury. The loss of Matty Stenson means Holleran is still in the market for an attacking reinforcements but he has been impressed with the way Bishop has hit the ground running on his return to the side.